It's a strange time of year for home fragrances. On the East Coast, at least, the heat is palpable, with a glimmering golden presence that holds forth outside from mid morning til early evening, sending most creatures scuttling for shade, the flowers bravely withstanding the glare (the cucumbers even daring to bask in it) and leaving only the cicadas and other whirring insects as a sign of life in the garden. Yet today there is a bit of a flirtatious breeze, lifting the leaves of the fruit trees to show their petticoats and playing tag with the dragonflies. It speaks of autumn days to come, harvest time and the nourishing produce to be had borne of these golden days. What sort of home fragrance is best suited to this heat? Most days, to be honest, I would simply rather go without. I like the scents of summer, scuffed crumbling dirt and hot painted wood from the deck, offset by utterly delicious wafts of the last summer roses. I tend to wear less perfume, if any, and go minimalist in the house. Still though, it is pleasant to have a little luxury in the guest bathroom, or — if you have air conditioning — a little something to keep the air from being too stuffy. I've recently ordered some floral candles from Diptyque, and if those are a success I will be sure to review them, but today I thought to share my experience with two offerings by Anthousa. Their diffuser in Aqua Verbena — described on their website as containing a sparkling lemon verbena note underscored with ozonic notes and complemented with 'breezy' florals such as freesia and lily of the valley — is quite nice, and is a very light scent I find particularly suitable for the bathroom, although it might be nice in a living area as well. Of all the diffusers I have tried, this one gave off the faintest scent, making it suitable for hot months and climates, and I did appreciate the effervescent and fresh fragrance. I found it reminiscent of a lemon verbena champagne cocktail — light, green and a bit bubbly with a very slight hint of dryness that brought to mind the slight note of yeast in champagne. The floral aspect was not particularly noticeable, but it was more sweet than dry. Those who prefer something a bit stronger and sweeter might enjoy their Pomegranate & Mint diffuser, which the website describes as a 'burst of sparkling fruit notes', including pomegranate, dragon fruit, white peach and and winter berry, blended with hibiscus, freesia and mint. As diffusers go, I would not say this is heavy, but it is borderline for me at this time of year. It reminds me of nothing so much as a glass of iced fruit tea with a sprig of soft mint. The fruity note is somewhat generic — something between cassis and peach without being anything immediately recognizable, but just generally sweet and friendly, and the mint is soft, used in a way reminiscent of L'Artisan Parfumeur's Thé Pour Un Été. In fact, the similarity was such that I wondered if there might be both jasmine and tea in this blend, but it's probably just the interplay of light florals with mint. These are not my favorite diffusers from Anthousa — my favorite thus far is the Chinoiserie collection which I hope to review soon — but I like the quality and presentation, and they are long-lasting (which is important as they are not cheap). I purchased them in the petite size, and only use three bamboo rods at a time, which prolongs the lifetime of the diffuser greatly (I lost count after several months), and still provides enough scent for a small area like a bathroom. If you are scenting a larger area, you may need to use all the rods or buy the demi size. If you do like diffusers, I recommend their duo and trio sets, which allow you to try a selection of petite sizes from any one collection. Does anyone have a late summer home fragrance that they are thrilled with? Please do comment. Anthousa diffusers are $68 for 245 ml (Demi size), $40 for 100 ml (Petite) or $78 for a Trio Bouquet Citrus (three 100 ml diffusers, including both of the above plus Vanilla, Grapefruit & Blood Orange). For buying information, see the listing for Anthousa under Perfume Houses. These both sound nice to me … I like that they come in a petite size, since they’re pricey! I’ve been using Brooklyn Bunny Apple room spray lately. It’s nice and would be a nice fall scent too. I like the name Brooklyn Bunny Apple! Haven’t heard of it, will have to check it out! Thanks! I’ve been enjoying the Voluspa Victoria candle set. It comes with eight candle tins, approx. 45 hours burn time each, in a variety of fragrances from tropical florals to gentle musks and even a couple (Malayan Coco–coconut milk accord, shaved coconut bark, rich sandalwood, and eastern hinoki wood and Fleur de Cafe–African coffee flower, chai tea, fresh creme, and vanilla bean) that are just delicious. The tins last quite a while, and the wax is very high quality and scents my rather large bedroom very well. I believe I paid $62 for the set back in February, and I find there’s a good enough variety of fragrances for both warm and cold weather. The Voluspa set sounds enticing, and a good deal too! I think it makes great good sense to try a two-pack to create a hospitable atmosphere for holiday entertaining. The bonus I find is that lovely scents put me in a good mood, which makes me a better and more relaxed hostess, LOL. How’s that for justification? 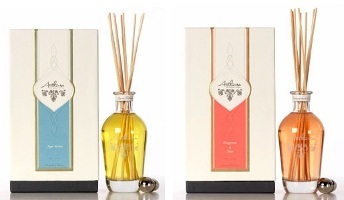 I haven’t tried Antica Farmacista diffuers yet, but hope to at some point. If they have something lovely, do update us!